Long anticipated this year - I've been looking forward to it for months! I invited several of my friends along as well. And I wasn't the only new person - apparently a friend of my dad wrote an article about him and this hike, and it attracted quite a few new people, I believe the count this year was 23 people! It was a pretty good year for mushrooms, we found quite a lot of Honey Mushrooms, a fair number of edible toothed mushrooms, but interestingly enough no chantrelles or puffballs this year (other than two large ones well beyond their prime). The best find was totally the pictured mushroom, which *grows on other mushrooms*, exactly as pictured - that's just the way it is! Check out my complete flickr set: mushroom forey 2011. 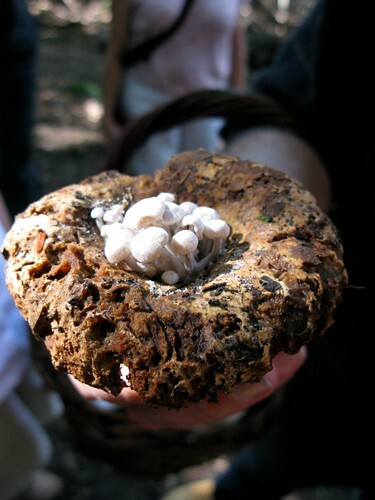 See also my friends photos: fungus, slimes, mushroom, the last dozen or so are from the hike. She even has them all properly labelled and stuff!